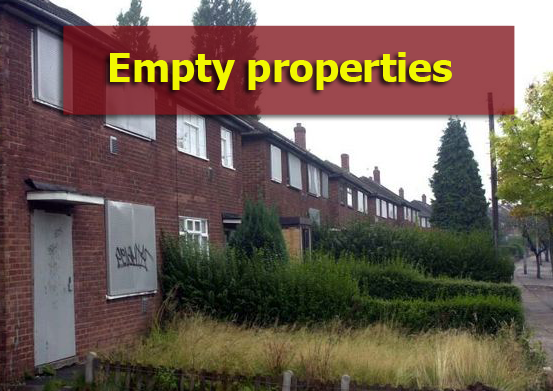 Empty properties – turning loss into profit. Empty properties are those properties which are not rented and no one is living in them. Those empty vacant buildings which are incomplete and are not used since long time. These properties can be identified very easily. The typical signs of empty buildings are trash in front of the building, dried up and overgrown lawns, dying trees, windows with boards nailed on them to secure the building and worn out paint. There are a lot of problems related to empty houses. There are thousands of houses empty in our city. In Japan there are 8 million empty houses. In UK there are 200000 empty houses. In Paris there are 100000 vacant properties. On one side there is a high demand for affordable housing on the other hand there are a lot of empty properties. Some of them are those incomplete buildings which require more construction. These buildings are everywhere. Ask any one and he will tell you about some of these properties which are vacant since his child hood. For example there is an uncompleted plaza right in front of the “provincial assembly house” Quetta. It is in incomplete condition for a long time and still vacant. We don’t know why it is incomplete, but it is a diamond in the rough which requires some attention. Another example can be Baldia plaza. Baldia plaza has an ideal location but most of the shops and offices on the upper floors are empty. serious measures need to be taken to convert this loss into profit. Why is property empty or not in use? One of the basic reason is lack of proper systematic communication. Or the lack of an experienced real estate dealer. Some property owners think that they can do every think on their own and they don’t involve property dealers. When the empty house remains vacant for a long time than the landlord go to property dealer and ask him to find a suitable tenant. Sometimes these properties are empty for no reason. It’s only because of the negligence of owner. Some people say that they are rich enough that they don’t need to rent out their properties. Sometimes the owners cannot afford to fix their property because of lack of funds. No maintenance. The owners lives in another city or another country. The property may be owned. The owner took a loan from bank and could not repay his loan. This kind of property is one of the most problematic one. It is hard to locate the owner and even harder to help him. Inheritance is also one reason these houses are empty. Sometimes the owners hold that property as investment and wait for its price to raise. One of the reason the property is vacant for long time is because the house owner is looking for a good tenant. There are various reasons why house, apartments and plazas are empty. Empty properties can be a burden on the society. It can attract vandals or criminals causing serious issues for the society and the vacant property. Vacant houses deny living space to those people who are in real need. Too many empty houses decreases the price of other houses in the same area. Empty properties create problems for the neighboring properties like seepage dampness etc. An empty house can be a burden for the owner. Financial loss. Because the owner is not getting any rent. The owner spent more money on the house in the form of utility bills, watchman’s salary, property tax and maintenance charges. Benefits for land lords and owners for renting their houses. The value (price) of the house increases. Capital value of the house increases. Chance of getting a better offer for the property as it is generating good rent. No more in security in the empty house. No watchman salary to be paid by the owner. 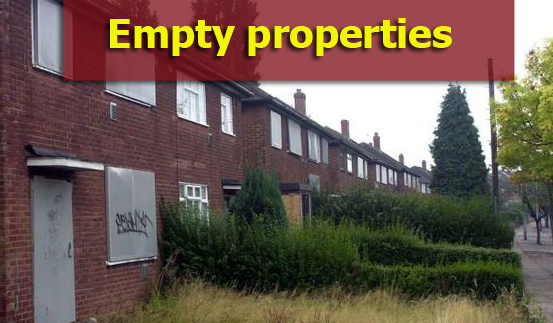 The government must make councils that carry out an extensive research and find empty homes. Local officials can come to know about these vacant properties through neighborhood research, registration, property tax and other means. Electricity and sui gas bills record also show that which properties are empty. 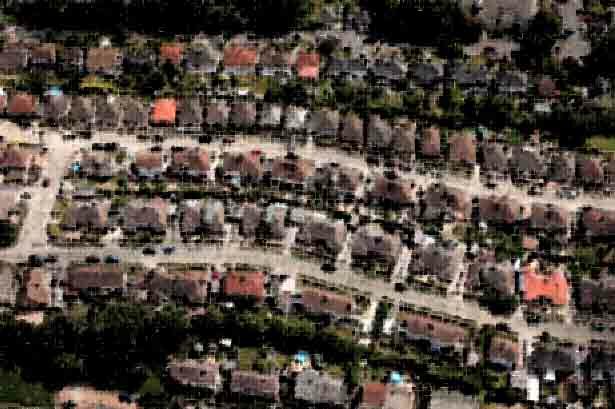 These councils (committee) must than come up with a proper plan how to get these houses occupied. The government must impose tax on all those houses or properties. if a property is vacant for more than 2 years it must have extra fine. Quetta development authority (QDA) once came up with the idea that all empty plots in QDA area will be fined, because the owners are not constructing the plots into houses, and they are becoming a spot where people throw garbage. In 2015 20 percent tax was imposed on the fair market value of rent of a vacant house in Paris. This year that tax on empty house was tripled to 60 percent. This generated some extra revenue for the city of Paris which they used to make affordable houses. Maintenance companies should be involved by the owner of the property. Dealers must be contacted to find proper tenant for the house. Who stay in the house for a long period? Watchman is very important for vacant properties. Tax free loans should be provided by the government to bring back these empty houses in shape. This kind of loan is called house to home scheme in UK. In England the government charges 3 percent extra on the purchase of a house if the purchaser already has 3 houses. Another easier solution is to Contact makanpoint.com for advice. We are here to find the right tenant for your property. We can tell you about different ways you can raise some funds for your empty property. Councils that work for the betterment of empty homes. Wigan council in UK helps empty homes to get on the right track. They repair old empty houses and rent it out to people. For example When Mr. John inherited 3 buildings from his father. He didn’t know what to do with that because the buildings were incomplete. So Mr. John applied for an interest free loan. Wigan council provides loans funded by the homes and communities agencies. Mr. John used that loan to complete his buildings and made apartments in the building. The apartments were than leased to wigan council. The loan was paid back by the rent of the apartments. This loan scheme is used to reduce the number of empty houses. Which is becoming very useful for the people. Wigan council in UK is also using other methods for the betterment of society. They also charge 150 per cent tax on houses that has been empty for more than 2 years. They also sell empty houses in auction. Wigan council helped 22000 homes to remain rented and occupied. The councils also send questionnaire to the house owners to know about their problems. Councils help you know what kind of repairs are needed for your empty house. Councils make estimates of the costs. Councils provide information about workers and contractors to the owners of the house. Councils let you know how you can get a loan for your property. Councils provide you contact numbers of real estate dealers who can find tenants for your house. These councils in the UK are so powerful that have access to certain kind of legislation by which they can force owner of the property to take certain action. In Quetta. Municipal Corporation and Quetta development authority can carry out these duties. Also read our article about affordable housing click here.